Gotthard Base Tunnel, World's Longest, Deepest Tunnel, Is Officially Open In Switzerland : The Two-Way Switzerland's Gotthard Base Tunnel stretches for more than 35 miles and runs a mile and a half deep under a mountain range at some points. The engineering feat was inaugurated with modern dance. 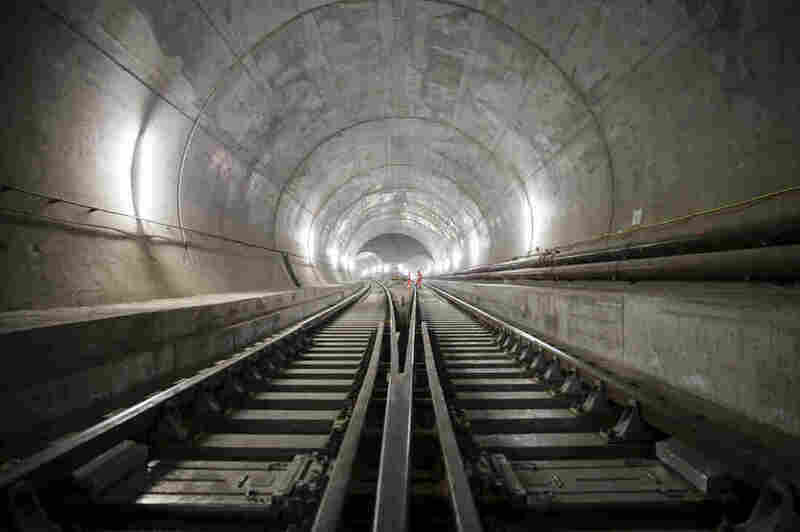 Train tracks lead toward an access tunnel inside the east section of the Gotthard Base Tunnel in Faido, Switzerland, in 2014. The tunnel had its opening ceremony on Wednesday. Swiss engineer Carl Eduard Gruner first imagined it in 1947: a massive tunnel, unprecedented in length, buried a mile and a half under Switzerland's symbolic Gotthard mountain range. Nearly seven decades later, after redesigns, political disagreements and the long, slow work of drilling beneath the Gotthard massif, as it's called, Gruner's dream is complete. The Gotthard Base Tunnel — a record-setting 35.4 miles long, and farther below ground than any other tunnel — was inaugurated Wednesday. The occasion was marked with a celebration that promoted "Swiss values such as innovation, precision and reliability," as the tunnel's website puts it. The $12 billion project was completed on time, The Associated Press notes. The 35.4-mile Gotthard Base Tunnel is the world's longest railway tunnel. Dancers performed at Wednesday's opening ceremony. The most eye-catching part of Wednesday's ceremony was an extended modern dance sequence — featuring stony-faced dancers dressed in orange construction gear and boots, dancing on and around a flatcar. Another sequence featured dancers in white briefs and one figure with wings and an oversize head, while yet another sequence had people covered in suits resembling a cross between a pompom and a hay bale. The inauguration of the tunnel also featured alphorns, an interfaith blessing of the tunnel and a tunnel theme song. Leaders from across the EU — including German Chancellor Angela Merkel, French President Francois Hollande and Italian Prime Minister Matteo Renzi, according to the AP — were in attendance. This weekend, tens of thousands of people are expected to participate in a public festival with events on either side of the tunnel — and, of course, the option to ride the train beneath the mountain range. 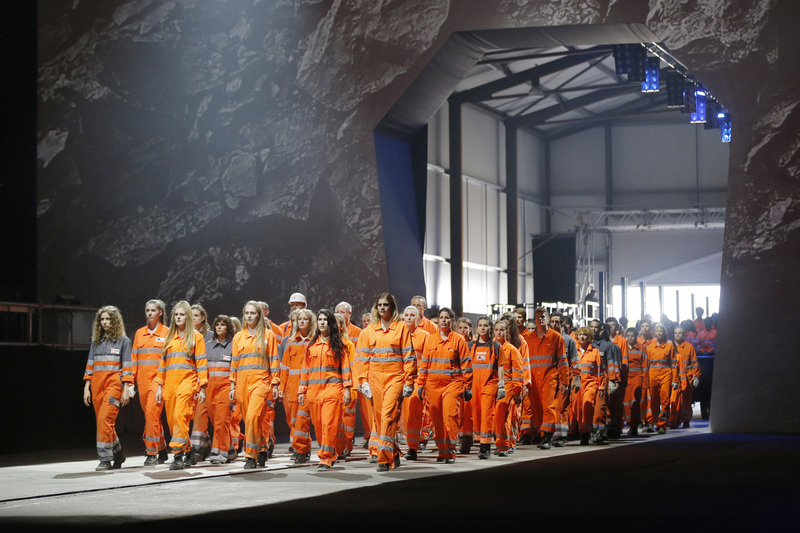 Artists perform in Erstfeld, Switzerland, on Wednesday at the opening of the Gotthard rail tunnel. The show was directed by German director Volker Hesse. When it opens for commercial service in December, the tunnel will remove thousands of polluting trucks from roads through pristine Alpine landscapes, as NPR's Eleanor Beardsley has previously reported. The high-speed rail running through the tunnel will make the train trip between Zurich and Milan about 45 minutes shorter, cutting it to 2 1/2 hours. From first blast to opening celebration, the tunnel took 17 years to complete; nine people died in the process. "Engineers had to overcome crumbling rock and underground rivers they found along the way," Eleanor says. "The entire Swiss nation was captivated by the project, following it every step of the way." The world was watching, too. 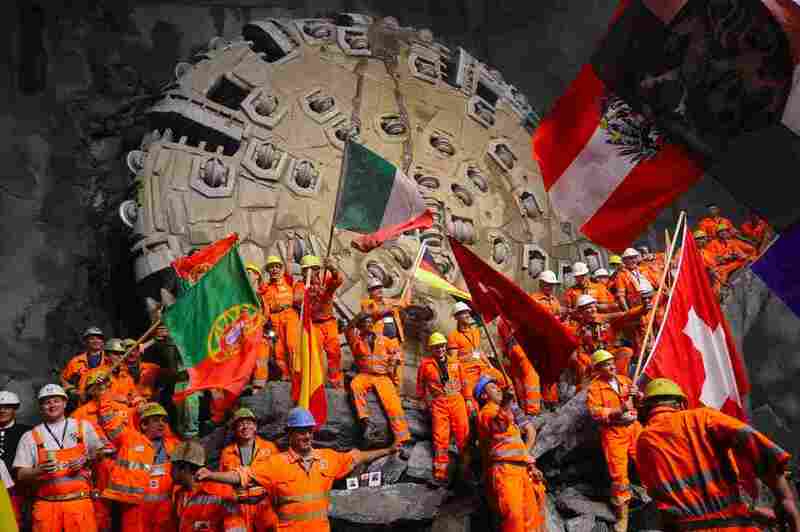 Miners celebrate beneath the Swiss Alps in 2010, after a giant drilling machine bored through to create the world's longest tunnel. After several more years of work, the train line through that tunnel is now open. "There is a certain majesty in projects of grand engineering. A majesty and an ambition to reshape the very make up of the world. You can't stand before the Hoover Dam, or transit the Panama Canal, or drive over the Golden Gate Bridge without being moved. They are sublime in their impact, symphonies of concrete and steel that just make you proud to be human." "The pass and then the original tunnel, higher up and shorter, were so important a trade route, a route of people and goods and information, that Swiss troops were concentrated there in World War II. And Swiss citizens decided the Gotthard Base Tunnel was important enough they would tax themselves to pay for it, about $1,300 each. Every man, woman and child. This is not just a project of engineers, it is a project of a people."